Allnamics is a group of experts in the field of geology, geotechnics and foundation engineering. They can act as consultants or actually perform pile testing and geotechnical monitoring, both onshore as offshore. If you feel we can support you or your organization, please do contact us. The history of Allnamics goes back to the 1970s when the oil was discovered in the North Sea. When huge structures were built and subsequently placed on the sea bed the need arose to check the foundations.. This is when Peter Middendorp and Marcel Bielefeld, both working for TNO Building and Construction Research Institute at the time, laid the foundation of what is now Allnamics. Allnamics itself was founded in 2011 by 5 experienced engineers in the field of pile testing, geotechnical monitoring and soil mechanics, and this team continues to increase in size as Allnamics expands its operations. In 2012 a state-of-the-art wireless monitoring system, the PDR, was developed.. With products like the PDR as well as other advanced monitoring equipment, and detailed knowledge of all types of pile testing techniques, the ever expanding team of highly educated, yet practical experts of Allnamics is ready to support and assist our clients around the world. Allnamics is working from various offices around the world: in The Netherlands (both in The Hague and Amsterdam), Singapore, the USA and most recently also in Spain. In addition Allnamics is cooperating with agents and representatives in many other countries in the fields of geology, geotechnics, soil mechanics as well as foundation engineering and testing. Allnamics is working from their world wide offices, in The Netherlands in The Hague and Amsterdam, and in Singapore, USA and Spain. Allnamics is commercially working together with agents and representatives in many countries in the field of pile tests and geology, geotechnics, soil mechanics and foundation engineering. At Allnamics, experienced experts are working. Experts in the field of geology, geotechnics and foundation engineering. If you need some advice, please do contact one of our experts. Specialist for the investigation and judgement of existing foundations, including old foundations, like the ones in Amsterdam. As specialist involved in durability studies of many foundations, both from a technical as an economical point of view. The main contact person within Allnamics for the many offshore and nearshore related projects is Joost Bakker. With an impressive track record for offshore pile testing, both during installation and after completing the structure. Many years of experience in geotechnical and foundation engineering, as specialist in concrete piles, and in running business makes Marcel Bielefeld your contact for international business. Martijn van Delft has experience on many aspects of geotechnical engineering and monitoring. 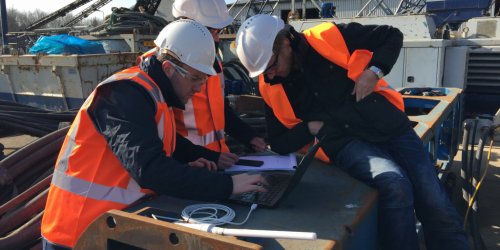 At Allnamics, Martijn is primarily the contact person for all geotechnical measurements. From settlement measurements to pile measurements, from static to dynamic measurements, and for vibration measurements (as well as vibration predictions). Kevin is specialist in inspecting and determining the quality and required maintenance of the foundations of existing and old buildings. Learned the basics of this specialism in Amsterdam, he’s now expanding this knowledge over other countries as well. 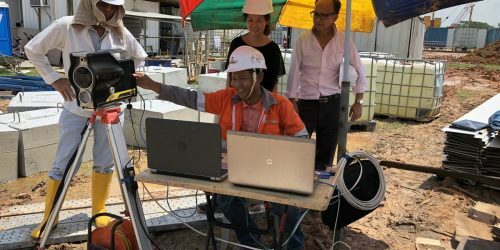 Kevin is also specialist in prediction and monitoring of vibrations of ground and structures, due to driving, traffic, etc. Being an expert in the field of behaviour of foundation piles during driving and pile testing, Rob van Dorp has gathered a huge amount of experience. As one of Allnamics geotechnical experts, Rob is primary in charge of the design of (deep) foundations, pile foundations, cofferdams, etc. Also the testing of these foundations, either by static, dynamic or StatRapid Tests. For well educated and highly motivated students, Allnamics has some projects waiting. Including bachelor and master thesis. Allnamics works at high quality and performance standards. Audits of independent auditors have proven that. As proof we present the ISO9001 Quality Certificate. Allnamics ensures that your personal data is managed safely. Therefore, cookies are not used by this website. If you want to delete your name and E-mail address from our database, please let us know. Otherwise, your data will automatically be deleted 10 years after the last contact.